The Modern Goddess Collection is Stila's Fall 2015 release and, to be completely honest, I find it a bit surprising (and not necessarily in a good way). I am used to seasonal collections with a lot of colour, a range of eye shadows, and at least a lip product of some sort. Modern Goddess has absolutely none of that. Instead, the focus is on flawless bronzed skin, with the only colour coming in the form of a liquid eye liner. That liquid eye liner is the Got Inked Cushion Eye Liner, which comes in 6 shades, with the most stunning of those shades being Amethyst Ink. It's a deep purple with a very slight metallic shimmer. The formula is long-wearing but does require a some layering since I found it sheerer than I would have liked. What's most innovative about this liner, however, is that it uses the cushion technology that some of you might remember from the Asian cushion foundations that have been popular for years. The dispenser is a cushion-y sponge saturated in product, so when you press your brush into it you get just the right amount. I recommend using the accompanying La Quill Precision Eye Liner Brush, which is perfect for getting a thick cat eye. 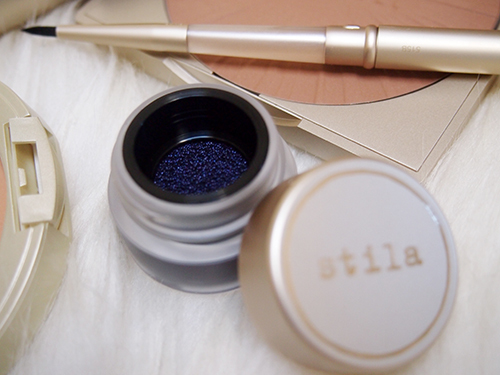 Along with the cushion eye liner, Stila has also introduced its new Perfectly Poreless Putty Perfector. Blending a traditional pressed powder with a cream foundation, the result is a texture unlike any I have ever felt before. It's so hard to describe but think of something slightly wetter than a pressed powder that has a "bouncy" feel. The coverage is pretty good and feels lightweight. However, I think this product is better suited to normal/dry skin since I noticed my skin getting shiny not long after application. That means an additional powder is necessary for us combination/oily skin girls, which essentially negates the 2-in-1 benefits of this product. All in all, I love the feel and the innovation, but I don't love the Perfectly Poreless Putty Perfector -- on me, anyway. 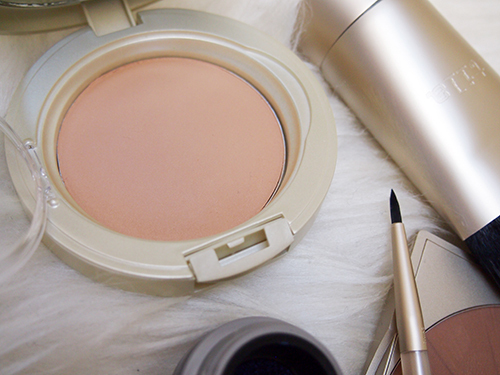 What I do love is the Wonder Brush for Face & Body. In fact, it appears my two favourite products from the Modern Goddess Collection are the brushes. The Wonder Brush feels nice and weighty, and is ergonomically designed to fit into your hand. The synthetic bristles are short and dense, and it can be used with all kinds of products, from powders to liquids and creams. 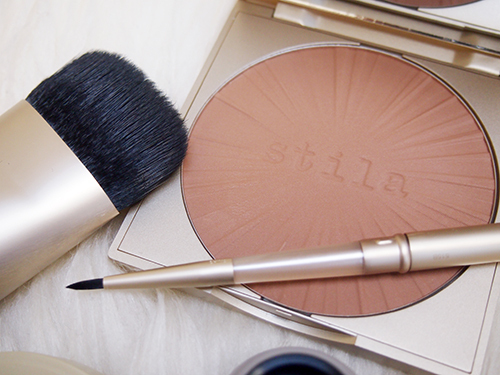 It is also great for bronzing and contouring with something like the Stay All Day Contouring Bronzer, a matte-satin powder that can be used to sculpt and shape both the face and body. The last two products in the Modern Goddess Collection are for the lashes. My first foray into fiber lashes was very recent (see here), so I was interested in seeing how the Lash Stunner Extreme Lash Primer stacked up. Instead of just being fibers, these are fibers in a brown cream, so you get some colour at the same time. The brown is still lighter than my naturally black lashes so I probably wouldn't wear this alone. 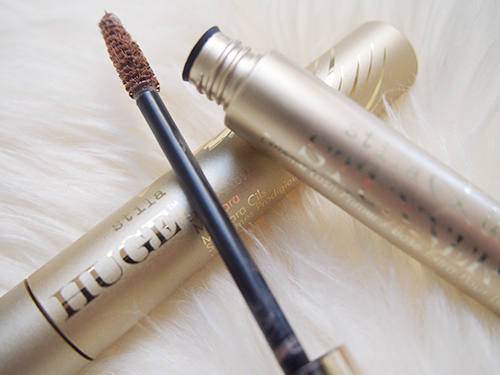 On top, I layered the HUGE Extreme Lash Mascara. A blend of soft, malleable waxes, this mascara is supposed to make lashes look fuller and bigger. While it does do that, like most mascaras I encounter, it did not hold a curl at all. If you have straight Asian lashes, I do not recommend this because the formula will weigh your lashes down. I had to re-curl after application which I hate doing since it often results in accidentally yanking out precious lashes. 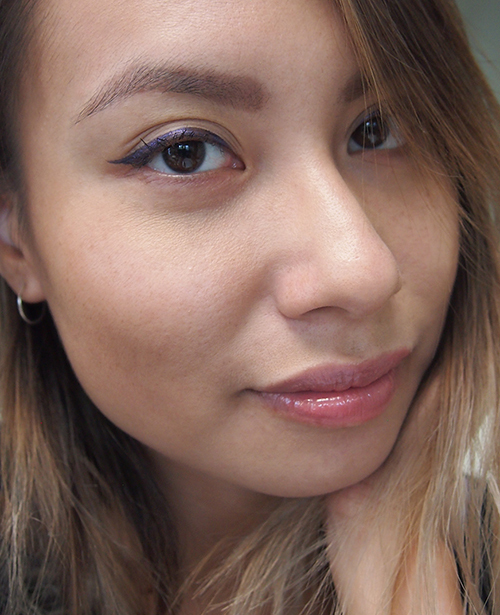 Above, I'm wearing all of the products in Modern Goddess, which I received from a media preview last month. But see what I mean about this being kind of a weird collection? There's hardly any colour apart from the eye liner. I know collections don't necessarily need to cater to the creation of entire FOTDs, but why are there no lip products? I'm actually wearing the lip combination from this post, in case you were wondering, because the entire look, plain as it is, did not look complete with bare lips. Final thoughts: Stila has introduced some interesting products which I'm sure fans will love, especially if you like new formulas and packaging, but this is simply not a cohesive collection. It might have made more sense to simply roll out the new products without lumping them together. I agree, the liner looks nice but nothing that makes me want to buy it. All the makeup looks amazing so beautifully packaged but not being much of makeup goddess I may just have to look and not try! I liked how you were able to do such short concise reviews of everything in this post! I actually really love the putty perfector. But I totally agree, the eyeliner is not what I imagined at all, it was surprisingly sheer and a bit streaky when I tried to layer it. It is a shame that the collection didn't have that wow factor. Sounds like a bit of a miss!